On Monday I went to a workshop on grief for suicide survivors. 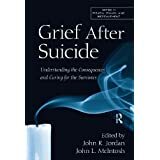 The speaker was John R. Jordan, Ph.D., author of the book, Grief After Suicide. This isn’t a blog about suicide so I won’t review the book or the man here, but if you are a suicide survivor this book and this man are compassionate places to start on your journey to recovery. I was not surprised to find that I didn’t know as much about my own grief as I thought I should. My experience with that very thing began less than four short months ago. The pain is fresh, the situation is current. Shouldn’t I know exactly what I’m dealing with? But no, as I said, I was not surprised to find I was in the dark – about a lot of things. Why was I expecting to find out that I was unaware of a lot of the aspects of grief in this circumstance? Because I have ADHD, and because my diagnosis came late in life. That makes two good reasons for my lack of confusion about my lack of perception. Yes I have ADHD, and as such I have a hard time seeing the forest when I’m looking at individual trees. I also have a hard time seeing other important trees when I’m focused on a few of the more interesting or obvious ones. Grief is all encompassing. It tints or taints every aspect of your life. Tracking down every one of its invasive tendrils is a never ending task. You soon realize that it’s all you can do to locate them, catalogue them and accept them. There is no eradicating them, only learning to deal with them. That list could go on for ever and lead me away from dealing with my grief. The good thing about grief (if it can be said to have a “good thing” about it), is that it will always remind you that it is there. You will never get far away before it manifest itself. Sometimes it’s a gentle tug at your sleeve and sometimes it’s a dagger in your heart, but you’ll be told you are grieving in no uncertain terms. How did I manage to get to the age of 50 without knowing I had ADHD? The deal is that many of us with ADHD have very poor self awareness. The term used by the mental health community is “inadequate meta cognition.” The paradox is that I am fully aware of my lack of self-awareness (paradoxes are the root of much humor). I knew I’d learn things about what I was going through because I know myself well enough to know that I don’t know myself well at all. I was coasting through much of my grief without taking the wheel, taking control. I’m not sure I can change that, but I’m aware of it now. with. Ginger Rogers had to do everything Fred Astaire did only backwards, in high heels and a dress, and all the while, she had to make him look good. Like Ginger, I also have my work cut out for me. I must deal with the issues of ADHD, grief and loss while continuing to maintain my household, my obligations, my life and my friends. To top it all off, my psychologist had to reschedule this week’s appointment, thank goodness I have you people to talk to. Where’s your couch?